(Pack of 100) Australian $1000000 Dollar Note. 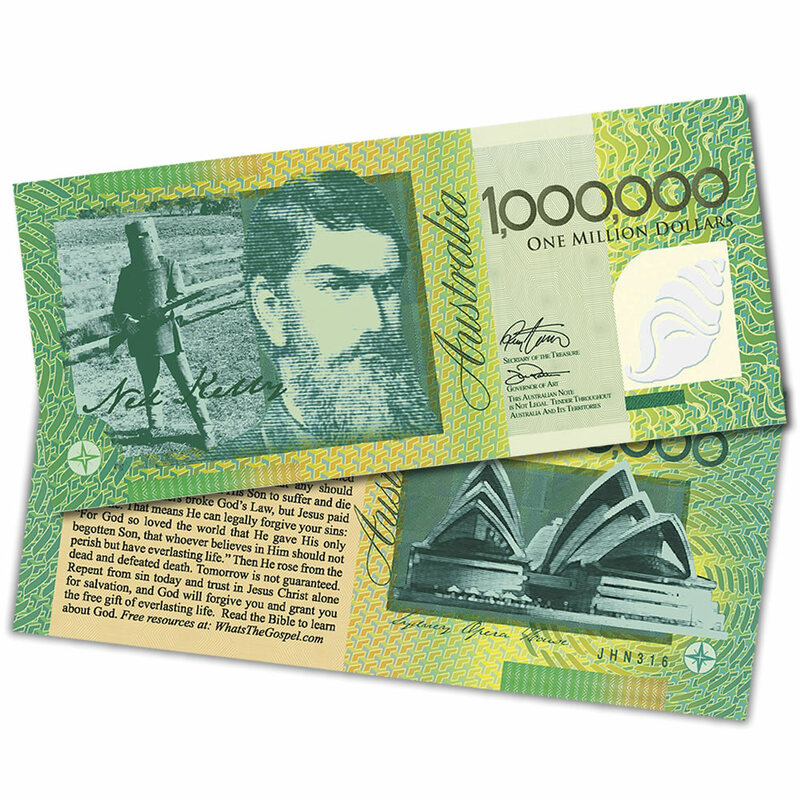 The Aussie Million Dollar Notes are our most popular because of their incredible ability to grab people’s attention. We have continued to improve the Million Dollar Note over the years to make the message clearer and easier to understand as well as make the design more appealing. This Million Dollar note is the original design that has circulated Australia for over 5 years. Close to a million have been handed out around the country which although is a huge number, still means only 1 in 22 Australians have had one. On the front is featured the infamous Ned Kelly and the Sydney Opera House on the back. The Gospel message is on the back of the note. I use the Million Dollar note in conjunction with the Math IQ Card. I invite people to take the Math Test and promise them a Million Dollars if they obtain the correct answer! The combination of the two is a great conversation starter. these carry easily in my wallet and I leave them anywhere, men’s restrooms, tables, seats, cafes, etc or just hand them out. A wonderful way to share the Gospel. Most are thrilled to get a million dollars even if it is not a real note. And more than a million dollars is waiting for them in Heaven. A good tract to keep in your wallet, I leave them in restrooms, in restaurant menu’s and at doctors surgeries in magazines etc.